Heartburn happens. But there are more than a few things you can do to keep the burn at bay. Some simple changes in your lifestyle can make a big difference in how often you get heartburn — and how severe it is. 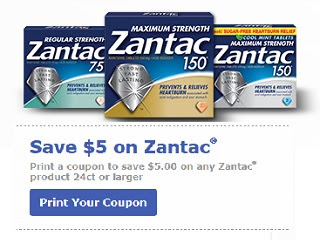 If that doesn't help, print out a $5.00 coupon good for any Zantac® purchase. You'll also be the first to find out about money-saving offers, new games, videos and site updates. Then just wait till Zantac® is on sale. I hear that CVS has Zantac® for $4.99!